Like many of us, Brenda Prowse and her husband, Hugh, spent Friday night watching the harrowing coverage of a series of terror attacks that killed more than 120 people in Paris. But Prowse happened to be watching it from her apartment near the Eiffel Tower. The former Poulsbo realtor has lived in Paris since January 2013. As gunmen and suicide bombers carried out the worst violence in Paris since World War II, she arrived at their apartment for the evening in the 7th arrondissement not knowing it was happening. “We were unaware of the horror last night until we returned from dinner and started receiving text messages from friends,” she told me. They watched the news until almost 4 a.m. Saturday. 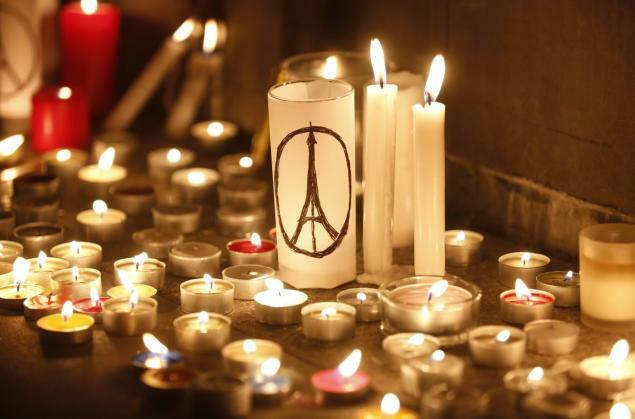 Only days earlier, they had gone to a bar near Place de la Republique, where two of the shootings occurred. While it feels close, in some ways, it also feels distant, this being Paris, she said. “Three miles is not that far away but in a city this densely populated it is almost another world,” she said. When they awoke Saturday, she went for a run. Their apartment manager lit a candle in the foyer. And while the streets were a little quieter, she said people were still going about their business. Even as the memorials grow around the city, it seems there’s an incredible resiliency in the City of Light, though its iconic Eiffel Tower is dark for the moment. “Parisians are out and about today and though wary, are not afraid to celebrate life,” she told me. The recipe for cooking up fake news stories in Kitsap County is simple, Calvin Courter says. Look for a trending topic on the Internet, find a way to give it a local twist, and sit back and watch it spread around the Internet like wildfire. Courter said he’s not surprised that readers have mistaken his headlines for the real thing (he’s even heard from a Seattle-based reporter who thought they were legit). He said he hadn’t meant to trick people, but rather to spice things up. “I like living here, but it’s a little boring,” he said. Courter and the Kitsap Sun have crossed paths before. He worked as an advertising account executive here in 2012. Today, he counts mortgage lending as his day job. The site took off faster than he expected. After its launch Jan. 2, he went out to the Portside Pub in Poulsbo. By the time he returned home, the site’s first article, “Twerking: Serious Problem at Kitsap School,” had accumulated 6,000 page views. The article today is up to almost 70,000 views. Not bad for someone who’s never taken a journalism class (he adds that he failed junior year English). But this is a guy who knows his news: he’s been reading the Kitsap Sun since he was a kid and grew up watching Almost Live! He is and will always be a news junkie, he said. Courter got tired of the barrage of posts he’d see on social media sites containing falsehoods, and so he decided to create some falsehoods for himself. 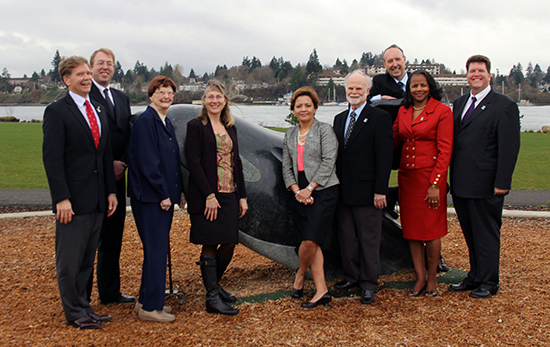 But don’t go calling the Kitsap Report a local version of The Onion. He welcomes contributions, and he’s looking to expand into the video medium. 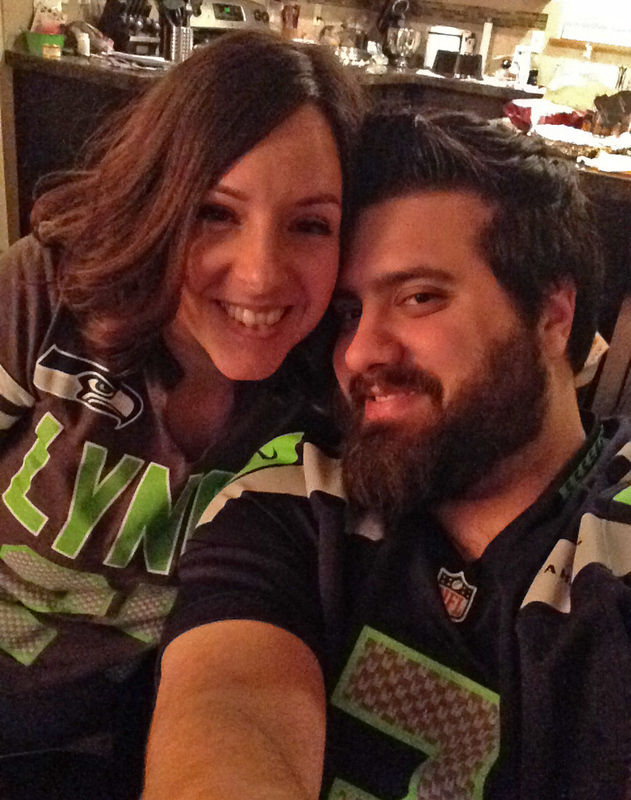 Christopher Hart, with his fiance Kristina Boyd. Like so many Seahawks fans, I was none too pleased when fans of the 49ers decided to throw up money for a billboard bragging about their previous Super Bowl victories. My good friend Christopher Hart decided to do something about it. Hart, once an employee of the Kitsap Sun and still a neighbor of mine in Bremerton, decided that if those 49er fans would donate their excess proceeds to Seattle Children’s Hospital, he’d challenge those same fans by galvanizing the 12th man to send their money south in support of San Francisco’s equivalent children’s hospital. He set an ambitious goal: $20,000. In just five days, Hart’s gotten $8,261 donations from nearly 300 people through his fundraising site. The Suquamish Clearwater Casino, where he works, has agreed to give a $5,000 match. And an anonymous donor in San Francisco, in the spirit of this competitive giving, has already pledged to match anything Seahawks fans give to the San Francisco hospital to Seattle’s — up to $100,000. 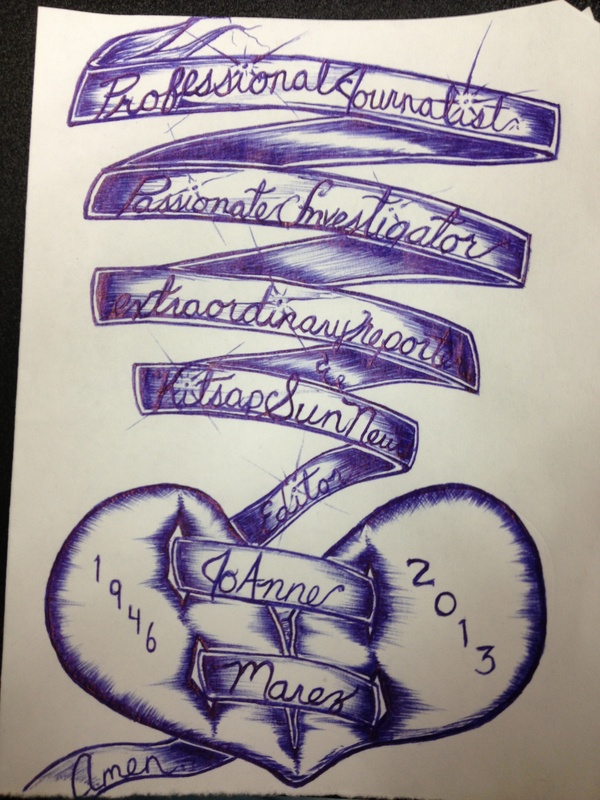 His work has resonated with fellow fans big time. Hart, with the help of former West Sound newspaperman Aaron Managhan, has appeared on various media outlets to talk about it. In his hometown paper, I wanted to give him a chance to explain, in his own words, how this thing grew from an idea to a wave of charity, and why he did it. A: When I saw the story pop up about the Niners fans paying for a billboard here in Seattle, my blood boiled for a hot moment. Then I realized that was exactly what they wanted. I started reflecting on the direction this rivalry was heading. I was kicking around the idea of just raising money for San Francisco’s Children’s hospital as a thank you for them donating their excess billboard funds to Seattle Children’s on Facebook. After some support from my friend Aaron Managhan, I put together the YouFundMe page. Q: This isn’t the first time you’ve put on fundraisers for children battling cancer and other ailments. Why is this particular kind of charitable giving so near and dear to your heart? A: We started doing something called Extra Life five years ago. It’s like Relay for Life, but instead of running or walking for 24 hours you play video games and raise money for your local Children’s Hospital. Every year we do this I meet people who tell me about their experiences at Seattle Children’s, and how it was completely live changing. They often take children with no insurance, and that’s where the funds we raise go towards, helping them get treatment. I don’t have children of my own yet, but I have a niece and nephew that mean the world to me. If something like this were to happen to them I would be pretty devastated. Q: Why do you think this resonated with so many donors? A: I think a lot of people felt the same way I did. A rivalry can be good and fun, but does it need to get nasty? I think when we put this out there people started comparing the importance of football with a child’s health. 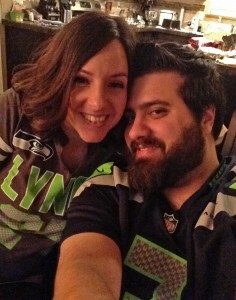 I can’t tell you how many people left comments that said “Now this is how a rivalry should go down!” from both Seahawks and Niner fans. I also think Russell Wilson and his continued visits and support to Seattle Children’s Hospital have shown people that football can really be used for something bigger than … well … football. Q: Were you surprised this effort caught the attention of so many, and if so, what surprised you most? A: When I started the campaign, I had hopes of it catching on. Thanks to Aaron’s web savvy it was everywhere almost instantly. I couldn’t believe how many people had shared it, the amount of comments it was garnishing on Reddit was really inspiring. I think what surprised me the absolute most though was the amount of San Francisco fans that embraced it. It’s completely painted them in a different light for me. Even the guy that raised the money for the billboard reached out to us telling us what a great idea he thought this was. Q: What is your ultimate goal here? A: Our ultimate goal for this was definitely to raise money for kids that direly need it while taking this rivalry in a more positive direction. It doesn’t have to be about bricks, banners or billboards. We have a great power in the ability to do good with the things we are passionate about. Bremerton ferry riders: Does that receipt say Bainbridge? Have you driven aboard the Bremerton ferry from Seattle, only to find your receipt says you went to Bainbridge Island? I asked the Washington State Ferries’ Marta Coursey about this frequent complaint. First off, we are only talking about cars here — pedestrians are counted at the turnstile where tickets are scanned at Colman Dock in Seattle. For vehicles, it is ferry policy that all sales are credited to the correct route for each ticket sold. 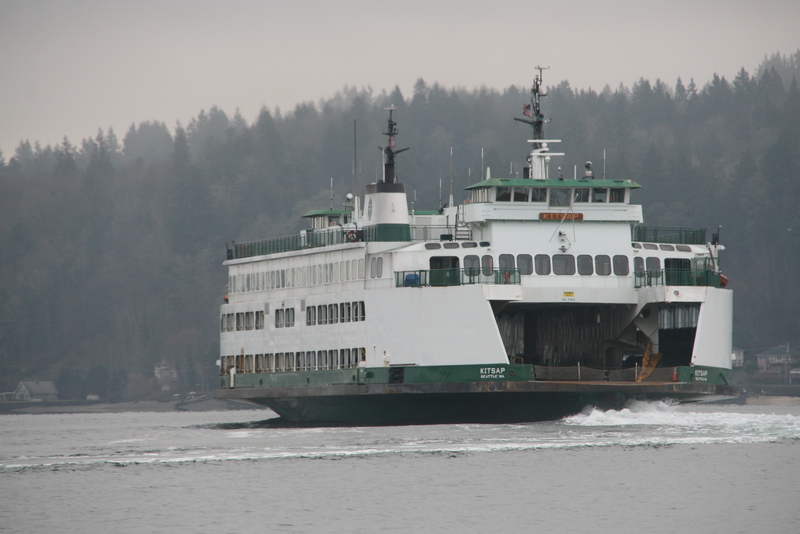 The ticket seller has a choice — Bainbridge or Bremerton — and the ferry system believes it’s important they pick the right one for the purposes of tracking ridership stats and planning, as well as accurate accounting. 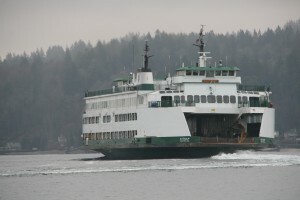 The big question is whether undercounting Bremerton cars actually harms Bremerton ferry service, the subject of a piece by Kitsap Sun reporter Ed Friedrich a few years back. But if nothing else, having accurate record keeping is important. 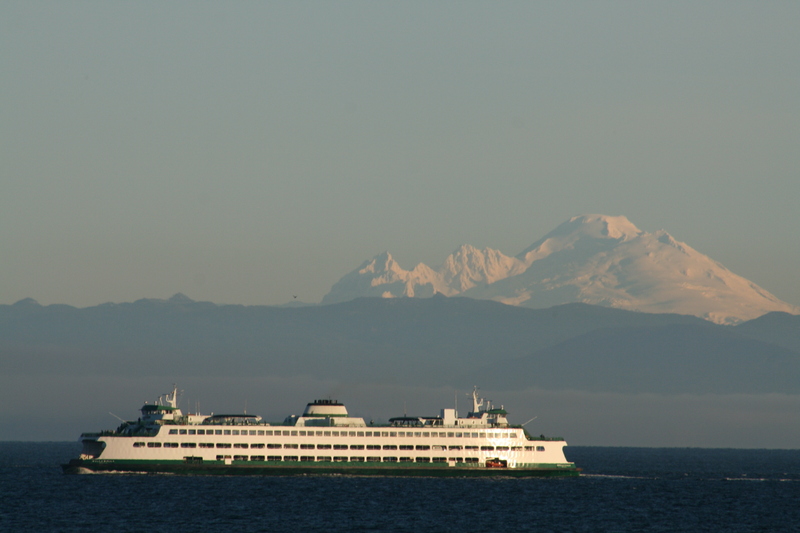 And that means Ann’s ferry trip should count toward Bremerton — not Bainbridge. In many ways, cities are living, breathing organisms, at least metaphorically speaking. And if you follow this line of thinking, you could also say workers with the Public Works and Utilities Department have been performing a metaphorical colon cleanse. 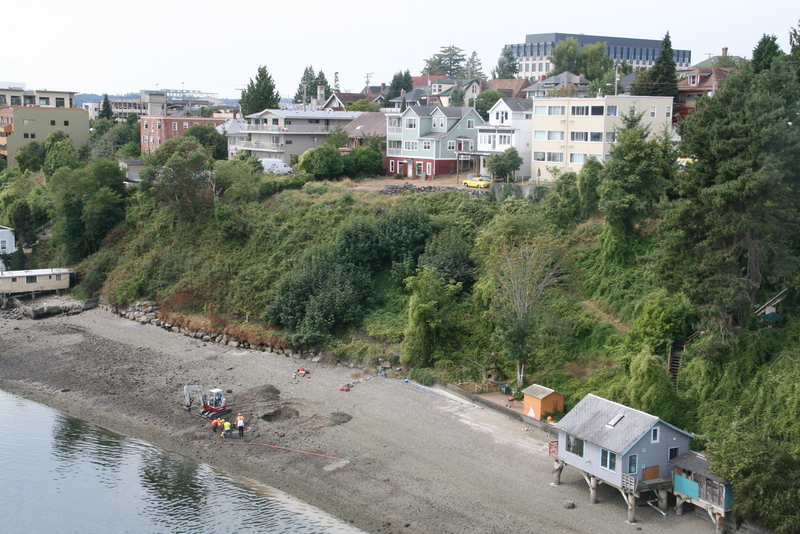 A sewer line, buried in the beach that runs from Bremerton’s boardwalk downtown all the way to a pump station at Evergreen Park, isn’t getting any younger. The cast iron pipe was installed in 1972 and is starting to clog, either due to solids building up inside or from internal corrosion (or both). So Bremerton’s sewer maintenance crews spent this past week on the beach (pictured) digging up the pipe at low tide, drilling a hole in it to “jet the line,” a process that is basically flushing it with water to try and clear it out. You may recall that this is the same line that city officials had planned to run underneath a proposed boardwalk between the downtown waterfront and Evergreen Rotary Park, but one that stalled due to perceived fishing rights violations from the Suquamish Tribe. With the boardwalk project stalled, the city has been looking for new ways to not only replace the line, but remove it off the beach entirely. Putting sewer lines on the beach has been cost effective in the past because gravity can run its course to the beach from the homes up above. Instead, the city now plans to install so-called “grinder” pumps that will take sewage up ground, underneath area streets instead, ultimately taking it to the sewer treatment plant in the West Hills area next to Highway 3. The city hopes to make the beach pipe obsolete in 2015 with the use of the grinder pumps. In the meantime, I told Bremerton Public Works Director Chal Martin that this kind of metaphorical colon cleansing will have to do.